(CNSNews.com) - The U.S. merchandise trade deficit with China set a record through June, hitting $185,721,300,000 for the first six months of 2018, according to data released Friday by the Census Bureau. From January through June, the Census Bureau reports, the United States exported $64,017,900,000 in goods to China while importing $249,739,200,000. The Census Bureau has posted the U.S-China merchandise trade numbers going back to 1985. That year, the United States ran a January through June trade deficit with China of $603,270,000 in constant June 2018 dollars. 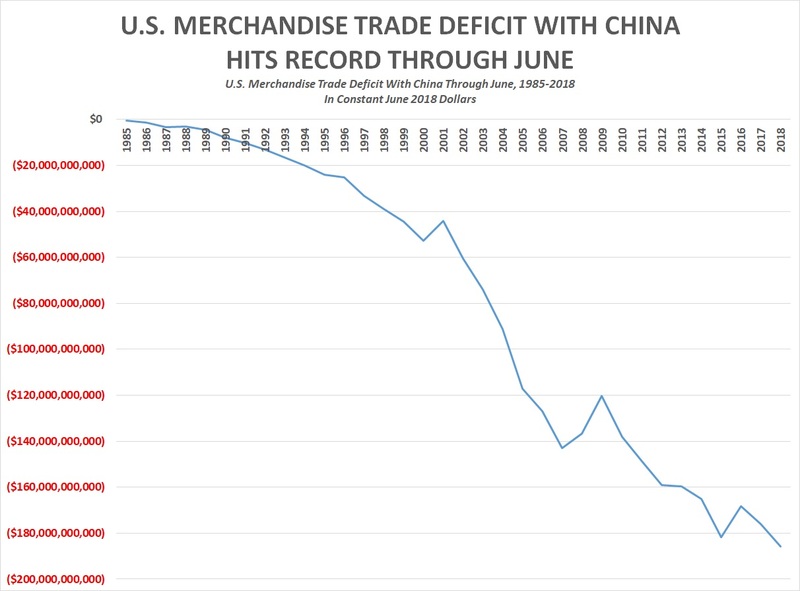 This year’s record $185,721,300,000 January through June U.S.-China merchandise trade deficit is about 308 times larger than the $603,270,000 U.S.-China merchandise trade deficit for January through June 1985. It is more than twice as large as the $91,139,390,000 merchandise trade deficit (in constant June 2018 dollars) that that U.S. ran with China in 2004. 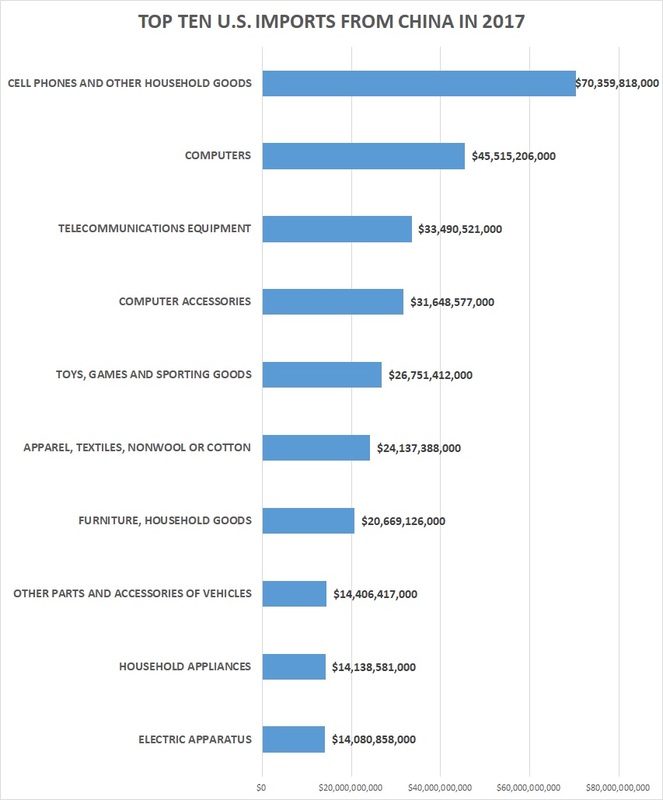 In 2017, according to the Census Bureau, the top four imports the United States bought from China were cell phones and other household goods ($70,359,818,000), computers ($45,515,206,000), telecommunications equipment ($33,490,521,000) and computer accessories ($31,648,577,000). 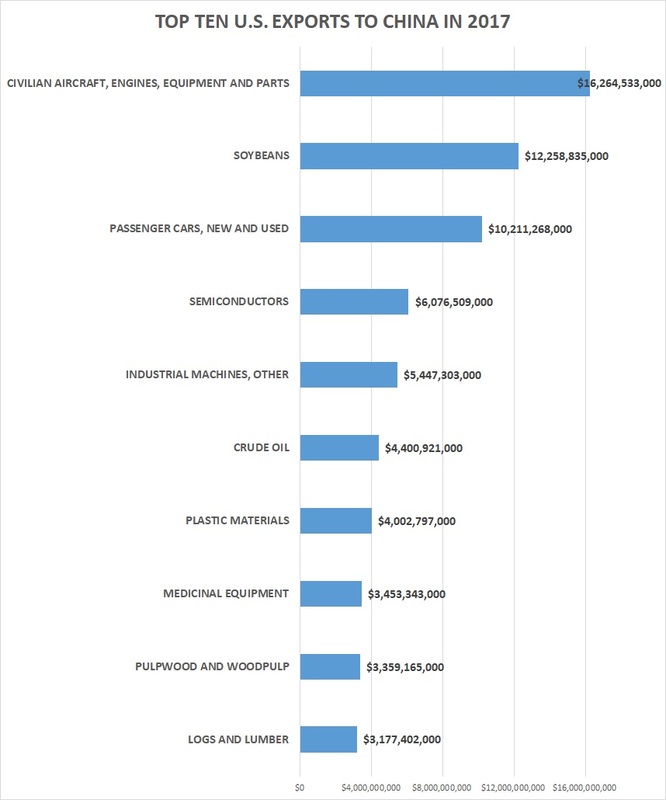 At the same time, the top four exports the United States sold to China were civilian aircraft, engines, equipment and parts ($16,264,533,000), soybeans ($12,28,835,000), passenger cars new and used ($10,211,268,000) and semiconductors ($6,076,509,000).